We Clean Anything Skeletal, Smelly Or Not! Serving taxidermists, sportsmen, museums, fish & game departments, fishermen, nature centers, police departments, medical schools, artists, teachers, and trappers. This is one of the only commercial businesses of its kind. 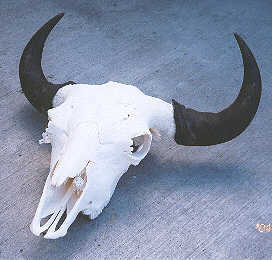 Big Sky Beetle Works is a licensed taxidermy business doing skull and bone cleaning only, for European and all other style skull mounts, including full skeletons. No Distortion - Minimum Shrinkage - Beetle cleaning is far superior to boiling. Perfect for Boone and Crocket / Pope and Young Scoring. *Big Sky Beetle Works performs a service and does not sell beetles! 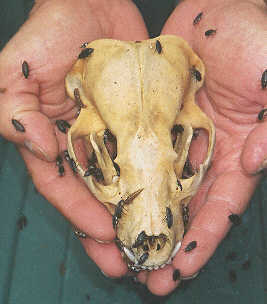 Skulls must be skinned and vertebrae removed. Remove eyes including meat underneath, remove tongue and detach the jaw. Remove excess flesh in back, top and sides of skull. All horns (not antlers) must be wrapped tightly with plastic wrap then wrapped completely with duct tape to keep them clean, dry and to prevent beetle damage. No liability will be assumed for beetle damage caused by improperly wrapped horns done by the customer or BSBW. Nor will BSBW be held liable for post cleaning condition of smashed or bullet riddled skulls or antlers with velvet of any kind. $30 Shoptime will be charged to pick up packages not deliverable by the shipping company due to smell or leakage. 50% DEPOSIT REQUIRED unless specific arrangements are made in advance with BSBW. .... Specify cleaning and/or bleaching, and a deposit.